We are pleased to announce that the Nancy Tuckerman Series of the Jacqueline Bouvier Kennedy Onassis Personal Papers is open and available for research. The papers contain personal and professional materials relating to Jacqueline Kennedy Onassis’s public and private life and her role as First Lady of the United States. They document her interest in such topics as the redecoration of the White House, travel, State visits, arts and culture, press coverage, as well as her involvement in a variety of cultural projects, organizations, and associations. The collection spans the years 1926 to 2002, and the materials consist principally of staff files, correspondence, clippings, photographs, scrapbooks, and albums as well as other materials accumulated by Mrs. Kennedy during the course of her life. The recently opened Nancy Tuckerman Files contain subject-based files and personal correspondence spanning Mrs. Kennedy’s last few months in the White House until her death in 1994. Nancy Tuckerman was the White House Social Secretary from June of 1963 until Mrs. Kennedy left Washington D.C. for New York in 1964, when Tuckerman then became Mrs. Kennedy’s personal secretary and chief of staff. 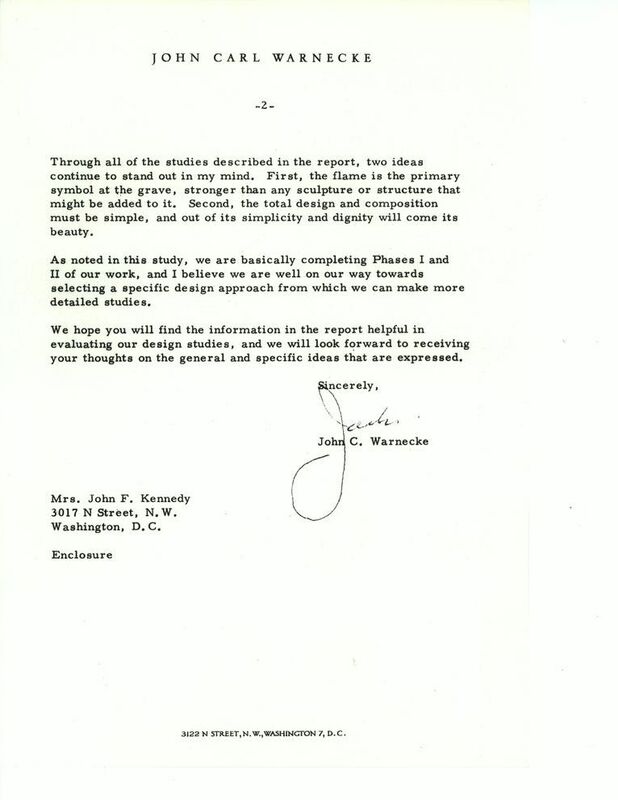 The subject files—the majority of material—are arranged alphabetically by type and are composed of memos, notes, and correspondence relating to general information on the First Lady and members of her family, projects and organizations with which she was associated, as well as memorials to President Kennedy. Jacqueline Kennedy, Caroline, and John, Jr. were present at the christening of the aircraft carrier U.S.S. John F. Kennedy on May 27, 1967, in which Caroline Kennedy did the honors of christening the carrier in honor of President Kennedy. 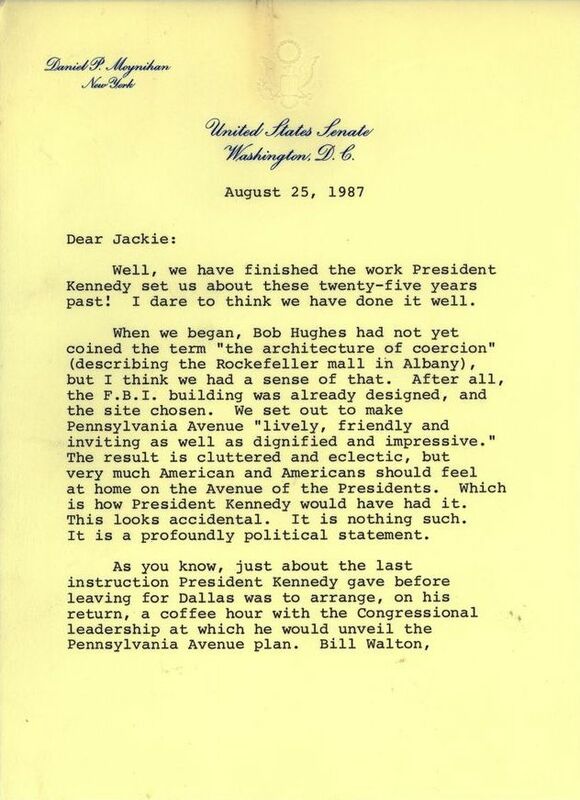 Jacqueline Kennedy was interested in finishing the work started by President Kennedy on June 1, 1962 regarding redevelopment of the Federal Triangle in Washington D.C.
(Below) Letter from New York Senator Daniel P. Moynihan informing Mrs. Onassis that the work had been completed. Pushinka was a dog that Nikita Khrushchev, Premier of the Soviet Union (USSR), gave to President Kennedy. 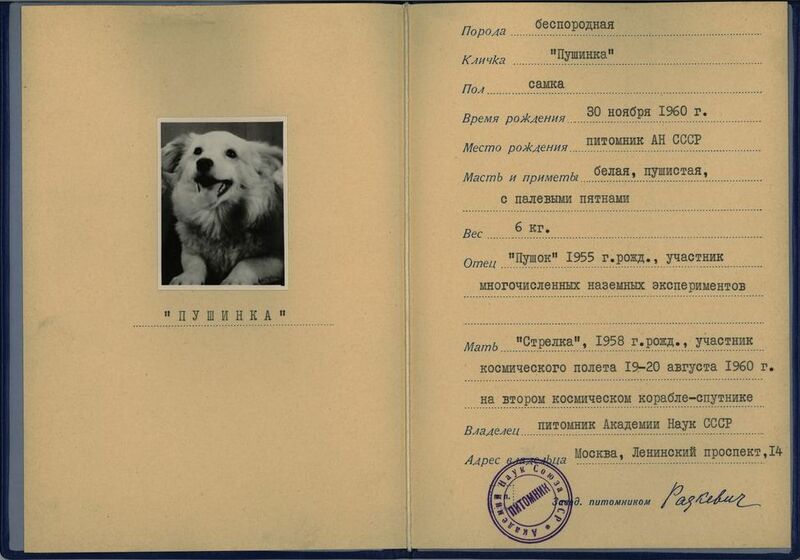 (Below) Pushinka’s original paperwork from Russia and the records for other family dogs can be found within Tuckerman’s subject files. The series also contains the White House files that Tuckerman kept in her role as White House Social Secretary. Included are materials relating to the White House redecoration project and the Fine Arts Committee, requests of the Social Office, state gifts, and state dinners such as the Nobel Prize winners dinner, which includes the guest book signed by invitees such as Pearl Buck, Robert Frost, and Robert Oppenheimer. 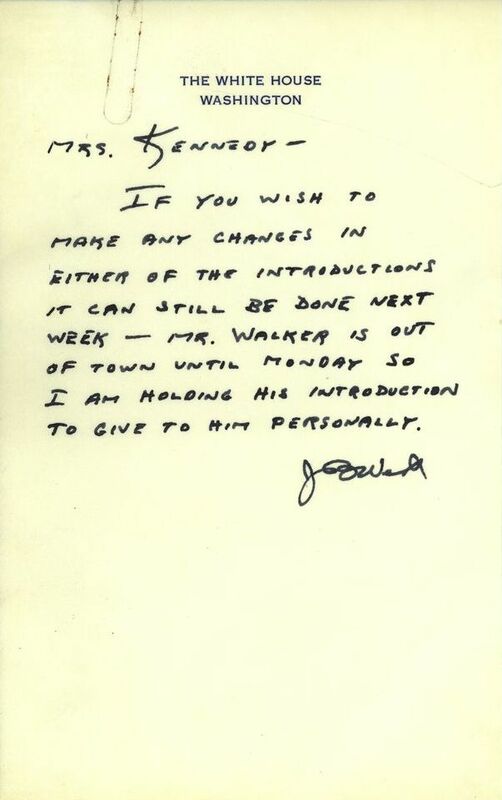 Of note are extensive handwritten notes from Mrs. Kennedy to Chief Usher J.B. West regarding the upkeep and running of the White House. Memo for Chief Usher J. B. West from Mrs. Kennedy outlining her specific instructions for how to photograph an official state dinner. 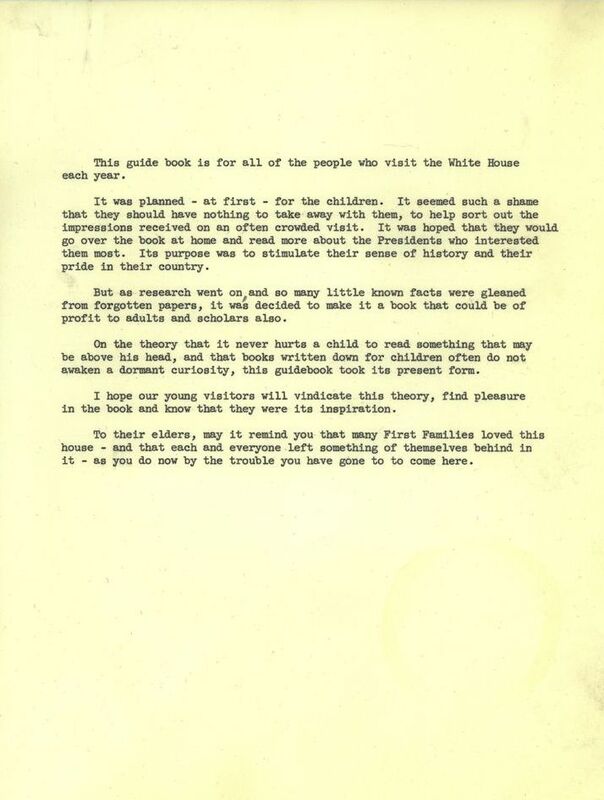 Two-page memo from Chief Usher J.B. West to Mrs. Kennedy regarding her introduction of the first White House Guidebook. 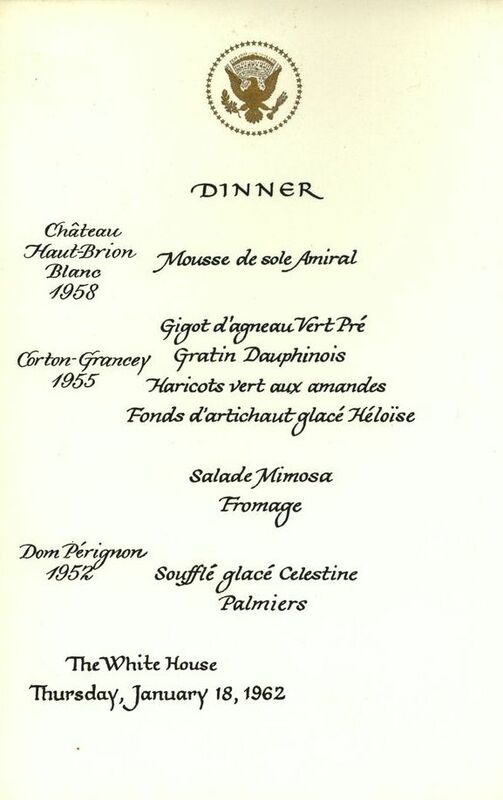 Example of a White House menu from January 18, 1962. The Tuckerman Series contains menus from February 1961 to October 1963. 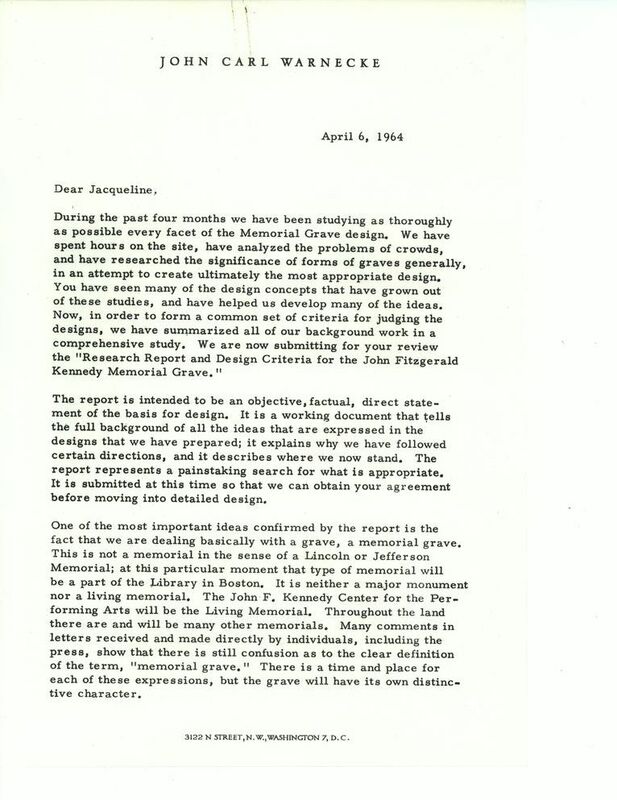 Also included in this opening is material relating to President Kennedy’s gravesite and condolence mail received by First Lady Jacqueline Kennedy (and personally handled by Nancy Tuckerman) after the assassination of the President. A small segment of condolence mail includes general mail addressing requests from the public, gift acknowledgments, and tributes and memorial projects. Other condolence mail includes anniversary remembrances, flower card enclosures, and V.I.P. mail from government officials and heads of state. 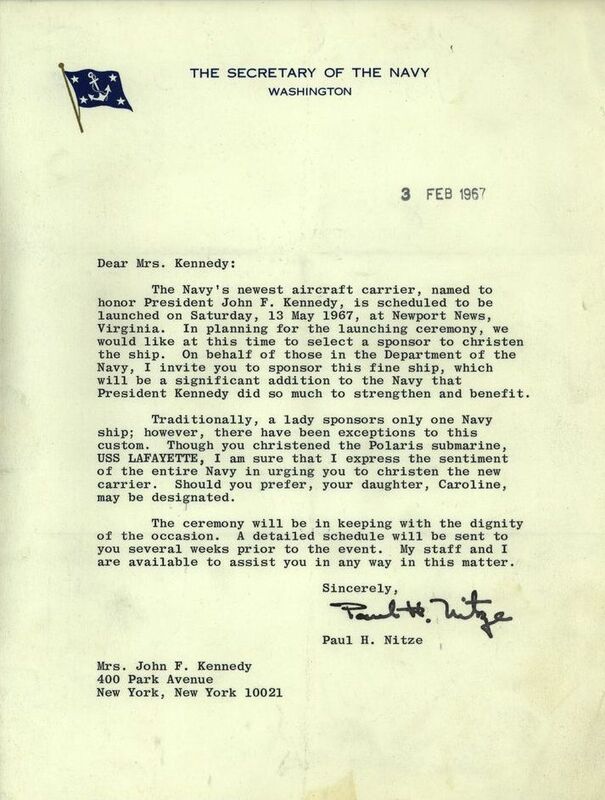 Of note are files relating to the volunteers who helped answer the large amount of condolence mail received after President Kennedy’s assassination. For additional condolence mail received by Mrs. Kennedy’s office please consult Series 1.2. Condolence Mail. 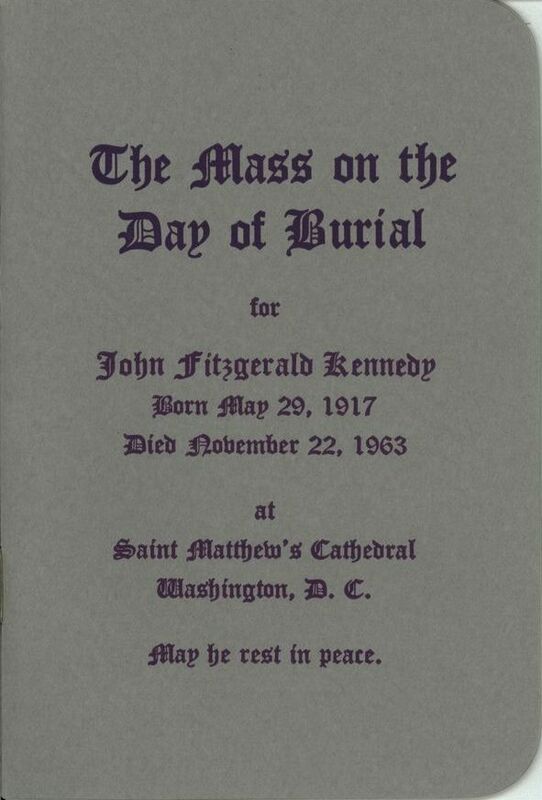 Mass service booklet on the Day of Burial for John Fitzgerald Kennedy, Saint Matthew’s Cathedral, Washington D.C.
(Below) Letter from John Carl Warnecke to Jacqueline Kennedy regarding the design of President Kennedy’s gravesite, as designed by John Carl Warnecke and Associates, Architects and Planning Consultants. 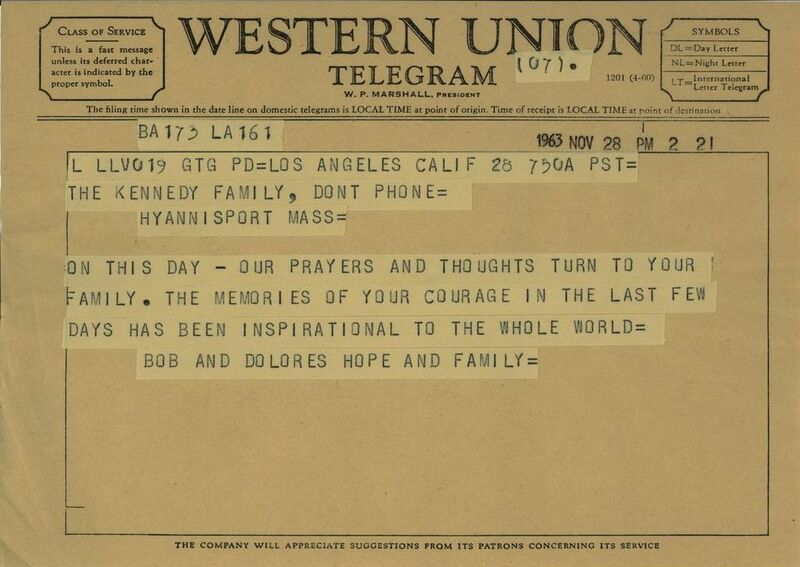 Condolence telegram to Mrs. Kennedy from Martin Luther King, Jr.
Condolence telegram to the Kennedy Family from Bob Hope. 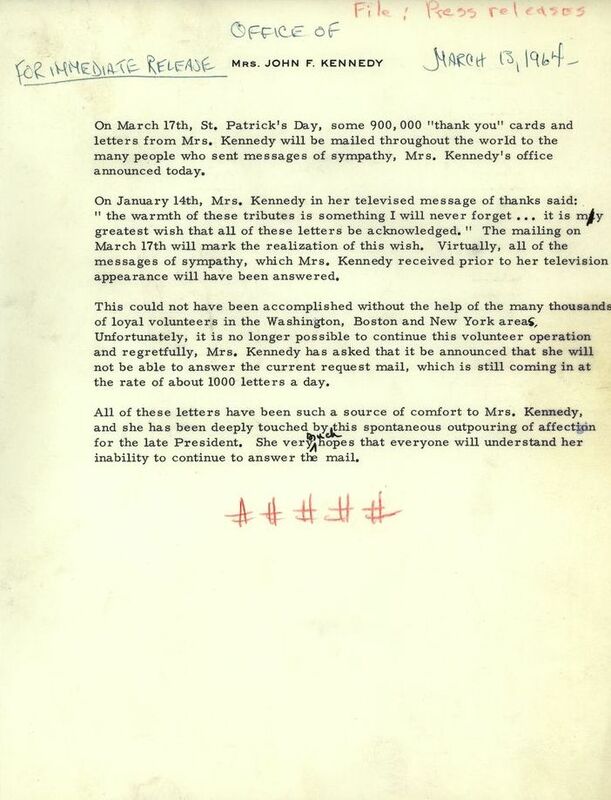 Draft of a press release thanking the public for their messages of sympathy and recognizing the thousands of volunteers who answered Mrs. Kennedy’s condolence mail. 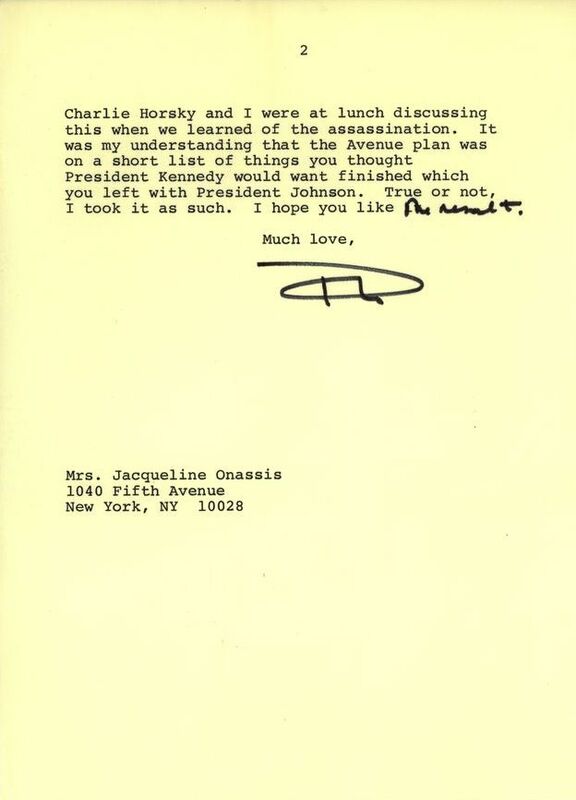 For additional information about the Personal Papers of Jacqueline Kennedy Onassis please refer to the full finding aid of the collection. This is fascinating. Will any of this be on public display at some point? My congratulations and appreciation for the hard work that went into gathering and cataloging this material. Thanks for your positive feedback. We cannot say with certainty that these particular materials will go on display any time soon; that decision is in the hands of our Museum curators. That said, individuals are always welcome to come to our research room to view the materials, themselves. This is very exciting news. I have read Mrs. Kind andennedy, realizing the importance of history in the making during her White House years, requested no paper to be thrown away. She supposedly asked her staff to save every piece of paper, even a couple of words jotted on a tiny scrap of paper. She was the only first lady to have the insight to preserve and restore furniture, memorabilia, even houses and streets. She was bold enough to revive history and smart enough to carry out her plan. I admire her so very much and am amazed in more material that would have been forever lost, but for her dedication. The Nancy Tukerman Files will be invaluable for every aspect of the Kennedy administration as well as for American history. Thank you for your research, time and interest. You will always be remembered for this priceless contribution. Thank you for your thoughtful comments about Mrs. Kennedy, and about the work we do at the Kennedy Library. Both are appreciated! Nancy Tuckerman mailed me a photo of JFK & family after his death. 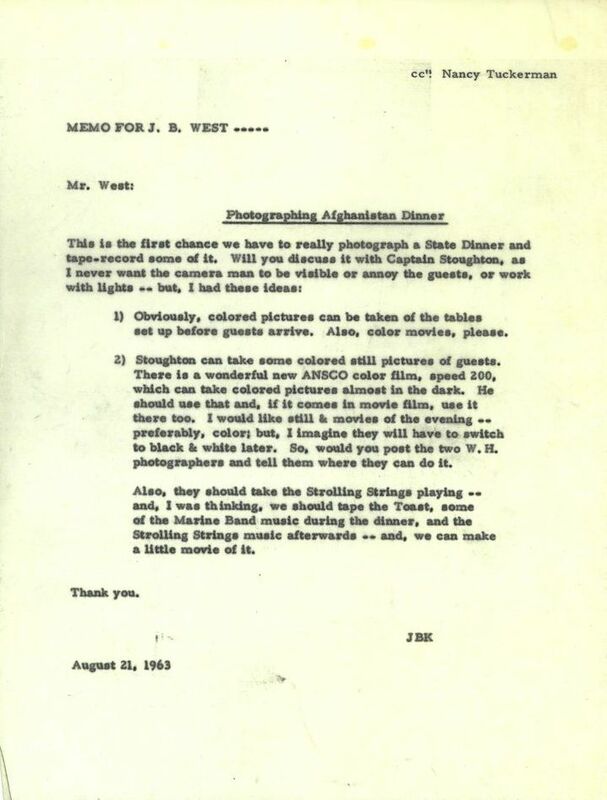 Has the letter & photo any value ? I live in Belfast Ireland. My wifes maiden name is Jacqueline Kennedy. Her Fathers name was JF Kennedy. Hence the mailed signed Photo & corospontence. While these items may not have high monetary value, I’m sure they have sentimental value. What a coincidence that the family names were so similar! Glad you like our blog. It was designed in-house and is based loosely on the Graphene theme. Let us know if you have any other questions, and good luck! I’m a huge fan of Jackie Kennedy thru books, footage, etc. so I went to watch Jackie, the film yesterday! Nancy Tuckerman was very impressive in the film so I googled her and was led to this blog! 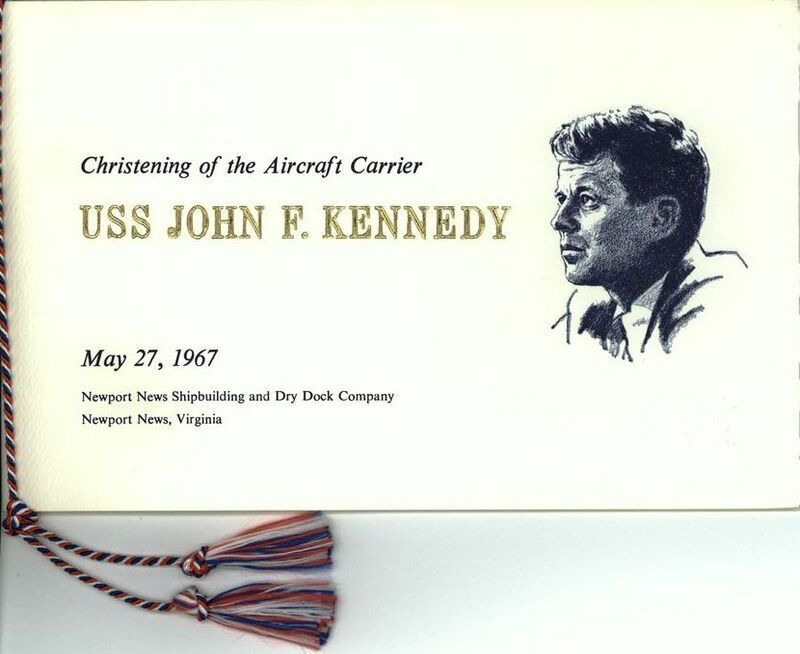 It was really touching to read about the christening of the carrier and Senator Daniel Moynihan’s Letter to Mrs. Kennedy! I wish our congress still had this kind of warm and productive spirit today in order to finish all work they are supposed to! Hope Jackie, the film wins all 3 categories it is nominated for in the Oscars this coming Sunday! When I was 12 years old, I wrote a letter to Mrs. Kennedy asking about her family. I received a thank you letter from Nancy Tuckerman, Social Secretary, on behalf of Mrs. Kennedy. 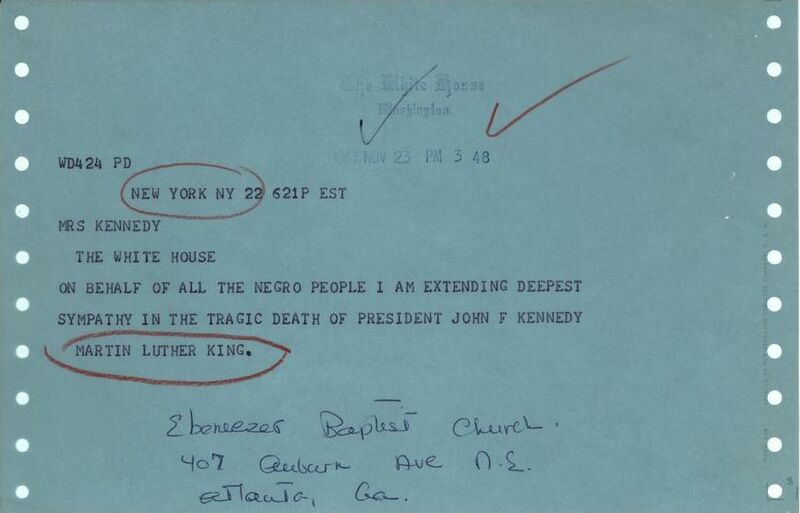 The letter is dated June 13, 1963. The letter and envelope from the White House are in excellent condition, even though they were in my childhood scrapbook for many, many years. I had them professionally framed last year as I realized the value of preserving our history.